Heineken NV is a Dutch multinational in the beer and beverage sector. Heineken is the largest beer brewer in Europe and the third largest beer brewer worldwide. To reach all employees in the 192 different countries, Heineken started giving webinars in 2015. 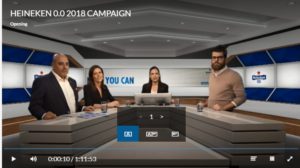 The webinars are used for presentations of the market-editing plans, global forum meetings, Heineken brand global platform communications and global company broadcasts. Heineken used to communicate with webinars without video, the so-called conference calls. And they organised global and regional physical meetings. Great tool to gain momentum and excitement from colleagues around the world. Audience reach and direct interaction with global participants, cost efficient, effective use of Global Team’s resource. Q&A section is litmus test for understanding of content and allows for local markets to share concerns, thoughts in real time. The Heineken webinars are promoted with messages and alerts via the internal network. Heineken employees rate the webinars as very good. “It contributes to the involvement, enthusiasm for campaigns and clarity about strategy and execution”. According to Heineken, deploying webinars reduces the time window that is needed to achieve results. Heineken also indicates that registration of the webinar is very useful for local markets, so that it can be looked back or shared with other parties on the local market. The webinars provide one voice and one message. As a tip, Heineken says “provide for local viewing in groups, with follow up and review discussions immediately thereafter”. “Keep content focussed, clear and sheets clean (because of the viewing dimensions via laptop”. Why choose Company Webcast as a webinar supplier? “Heineken already had experience with Company Webcast as a supplier” Heineken says.